If you walk into any grocery store you’ll find fresh fruits and vegetables available in fairly constant supply throughout the year. Fresh fruits add color and variety to any meal and because of their natural sweetness, are great for dessert and are a good low-fat snack alternative. There is no substitute for your own expertise when choosing the right quality of fresh fruit or vegetables. In addition it seldom pays to buy perishable fruits and vegetables just because the price is low. Unless the lower price is a result of overabundance, the so-called bargain may be undesirable. Buy only what you need. Refrigeration makes it possible to keep an adequate supply of most perishable fruits and vegetables on hand, but never buy more than you can properly refrigerate and use without waste — even if the product is cheaper in quantity. Keep on the lookout for deterioration. Even with the most modern handling methods, product quality can decline rapidly while on display. Sometimes, this off quality can be bought for less money, but the waste in preparation may offset the price reduction. Often a very attractive fruit or vegetable may not taste good because of a varietals characteristic, or because of some internal condition such as over maturity. On the other hand, a poor appearance due to poor color or superficial blemishes may be delicious. Quality is usually higher and prices are more reasonable when fruits and vegetables are bought in season. Out-of-season produce is generally more expensive. When you must handle a fruit or vegetable to judge its quality, use care to prevent injury. Rough handling causes spoilage and waste and you pay for carelessness in the long run. Fresh fruits and fruit juices contain many vitamins and minerals, they are low in fat (except avocados) and sodium, and they provide dietary fiber. Whole, unpeeled fruit is higher in fiber than peeled fruit or fruit juice. It is recommended that you consume 2 to 4 servings from the fruit group each day. Count as a serving an individual unit (one medium apple, pear, banana, orange), a fraction of a unit (grapefruit half, melon wedge), 1/2-cup berries, and 1/2 cup chopped or cooked fruit, or 3/4-cup fruit juice. Under federal guidelines, a substantial number of retailers must provide nutrition information for the 20 most frequently eaten raw fruits. These fruits are: bananas, apples, watermelons, oranges, cantaloupes, grapes, grapefruit, strawberries, peaches, pears, nectarines, honeydew melons, plums, avocados, lemons, pineapples, tangerines, sweet cherries, kiwifruit, and limes. Information about other fruits may also be provided. The nutritional information may appear on posters, brochures, leaflets, or stickers near the fruit display. It may include serving size; calories per serving; amount of protein, total carbohydrates, total fat, and sodium per serving; and percent of the Recommended Daily Allowances for iron, calcium, and vitamins A and C per serving. 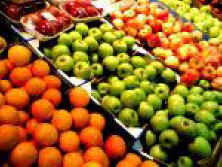 The following alphabetical list of fruits is designed as a reference to help you shop more intelligently. The best varieties to eat fresh are the commonly available: Red Delicious, McIntosh, Granny Smith, Empire, and Golden Delicious. For making pies and applesauce, use tart or slightly acid varieties such as Gravenstein, Grimes Golden, Jonathan, and Newtown. For baking, the firmer fleshed varieties — Rome Beauty, Northern Spy, Rhode Island Greening, Winesap, and York Imperial — are widely used. Look for firm, crisp, well-colored apples. Flavor varies in apples, and depends on the stage of maturity at the time that the fruit is picked. Apples must be mature when picked to have a good flavor, texture, and storing ability. Immature apples lack color and are usually poor in flavor. They may have a shriveled appearance after being held in storage. Avoid overripe apples (indicated by a yielding to slight pressure on the skin, and soft, mealy flesh) and apples affected by freeze (indicated by internal breakdown and bruised areas). Scald on apples (irregularly shaped tan or brown areas) may not seriously affect the taste. Most fresh apricots are found in June and July, but a limited supply of imported apricots is available in large cities during December and January. Domestic apricots are grown principally in California, Washington, and Utah. Look for apricots that are plump and juicy looking, with a uniform, golden-orange color. Ripe apricots will yield to gentle pressure on the skin. Avoid dull-looking, soft, or mushy fruit, and very firm, pale yellow, or greenish-yellow fruit. These indicate over maturity or immaturity, respectively. Avocados, grown in California and Florida, are available all year. Two general types, and a number of varieties of each, are grown. Depending upon type and variety, avocados vary greatly in shape, size, and color. Most tend to be pear-shaped, but some are almost spherical. Fruits weighing less than 1/2 pound are most commonly available. Some have rough or leathery textured skin, while others have smooth skin. The skin color of most varieties is some shade of green, but certain varieties turn maroon, brown, or purplish-black as they ripen. Despite this variation in appearance, avocados are of good eating quality when they are properly ripened, becoming slightly soft. This ripening process normally takes from 3 to 5 days at room temperature for the quite firm avocados usually found in grocery stores. Ripening can be slowed by refrigeration. For immediate use look for slightly soft avocados, which yield to gentle pressure on the skin. For use in a few days, buy firm fruits that do not yield to the squeeze test. Leave them at room temperature to ripen. Irregular light-brown markings are sometimes found on the outside skin. These markings generally have no effect on the flesh of the avocado. Avoid avocados with dark sunken spots in irregular patches or cracked or broken surfaces. These are signs of decay. Bananas develop their best eating quality after they are harvested. This allows bananas to be shipped great distances. Almost our entire supply of bananas, available year-round, is imported from Central and South America. Bananas are sensitive to cool temperatures and will be injured in temperatures below 55 °F. For this reason, they should never be kept in the refrigerator. The ideal temperature for ripening bananas is between 60 and 70 °F. Higher temperatures cause them to ripen too rapidly. Look for bananas, which are firm, bright in appearance, and free from bruises or other injury. The state of ripeness is indicated by skin color. Best eating quality has been reached when the solid yellow color is specked with brown. At this stage, the flesh is mellow and the flavor is fully developed. Bananas with green tips or with practically no yellow color have not developed their full flavor potential. Avoid bruised fruit (indicating rapid deterioration and waste); discolored skins (a sign of decay); a dull, grayish, aged appearance (showing that the bananas have been exposed to cold and will not ripen properly). Occasionally, the skin may be entirely brown and yet the flesh will still be in prime condition. Fresh blueberries are on the market from May through September. Generally, the large berries are cultivated varieties and the smaller berries are wild varieties. A dark blue color with a silvery bloom is the best indication of quality. This silvery bloom is a natural, protective, waxy coating. Buy blueberries that are plump, firm, uniform in size, dry, and free from stems or leaves. Avoid soft, mushy, or leaking berries. Most sweet cherries found in grocery stores are produced in the Western States and are available from May through August. Red tart cherries, also called sour or pie cherries and used mainly in cooked desserts, have a softer flesh, lighter red color, and a tart flavor. They generally are shipped to processing plants and are sold frozen or canned. Good cherries have bright, glossy, plump-looking surfaces and fresh-looking stems. A very dark color is your most important indication of good flavor and maturity in sweet cherries. Bing, Black Tartarian, Schmidt, Chapman, and Republican varieties should range from deep maroon or mahogany red to black for richest flavor. Lambert cherries should be dark red. Rainier cherries should be straw-colored. Avoid over mature cherries lacking in flavor, indicated by shriveling, dried stems, and a generally dull appearance. Decay is fairly common at times on sweet cherries, but because of the normal dark color, decayed areas are often inconspicuous. Soft, leaking flesh, brown discoloration, and mold growth are indications of decay. A number of varieties of fresh cranberries are marketed in large volume from September through January. They differ considerably in size and color, but are not identified by variety names in your grocery store. For the best quality look for plump, firm berries with a lustrous color. Duller varieties should at least have some red color. Avoid brown or dark, discolored berries and soft, spongy, or leaky berries should be sorted out before cooking, because they may produce an off-flavor. Grapefruit is available all year, with most abundant supplies from January through May. While Florida is the major source of fresh grapefruit, there also is substantial production in Texas, California, and Arizona. Several varieties are marketed, but the principal distinction in your grocery store is between those which are “seedless” (having few or no seeds) and the “seeded” type. Another distinction is color of flesh. Pink- or red-fleshed fruit is most common, but white-fleshed varieties are also available. Grapefruit is picked “tree ripe” and is ready to eat when you buy it in the store. For best eating look for firm fruits, that are heavy for their size.. Thin-skinned fruits have more juice than coarse-skinned ones. If a grapefruit is pointed at the stem end, it is likely to be thick-skinned. Rough, ridged, or wrinkled skin can also be an indication of thick skin, pulpiness, and lack of juice. Grapefruit often have skin defects such as scale, scars, thorn scratches, or discoloration. This usually does not affect how the fruit tastes. Soft, water-soaked areas, lack of bright color, and soft, tender peel that breaks easily with finger pressure are symptoms of decay. Most table grapes available in grocery stores are of the European type, grown principally in California and Arizona. Only small quantities of Eastern-grown American-type grapes are sold for table use. European types are firm-fleshed and generally have high sugar content. Common varieties are Thompson seedless (an early, green grape), Red seedless (an early, red grape), Tokay and Cardinal (early, bright-red, seeded grapes), and Emperor (late, deep-red, seeded grapes). These all have excellent flavor when well matured. American-type grapes have softer flesh and are juicier than European types. The outstanding variety for flavor is the Concord, which is blue-black when fully matured. Delaware and Catawba are also popular. Look for well-colored, plump grapes that are firmly attached to the stem. White or green grapes are sweetest when the color has a yellowish cast or straw color, with a tinge of amber. Red varieties are better when red is visible on all or most of the grapes. Bunches are more likely to hold together if the stems are predominantly green and pliable. Avoid soft or wrinkled grapes, or bunches of grapes with stems that are brown and brittle; these are the effects of freezing or drying. Also avoid grapes with bleached areas around the stem ends (indicating injury and poor quality), and leaking berries (a sign of decay). The kiwifruit is a relatively small, ellipsoid-shaped fruit with a bright green, slightly acidic-tasting pulp surrounding many small, black, edible seeds, which in turn surround a pale heart. The exterior of the kiwifruit is unappealing to some, being somewhat “furry” and light to medium brown in color. (While the furry skin is edible, some prefer to peel the fruit before eating.) Domestic kiwifruit is produced primarily in California, but imported kiwifruit is also commonly marketed. Look for plump, unwrinkled fruit, either firm or slightly yielding. Kiwifruit is fully ripe when it is yielding to the touch but not soft. Firm kiwifruit can be ripened at home in a few days by leaving it at room temperature. Use of a ripening bag or bowl will speed the process. Avoid kiwi that show signs of shriveling, mold, or excessive softening, all of which indicate spoilage. Some kiwifruit may appear to have a “water-stained” exterior. This is perfectly normal for the fruit and does not affect interior quality in any way. Kiwifruit contains an enzyme, actinidin, similar to papain in papayas that reacts chemically to break down proteins. (It has been used as a “secret ingredient” to tenderize meat.) Actinidin prevents gelatin from setting, so if you are going to serve kiwifruit in a gelatin dish, cook the fruit for a few minutes before adding it to the gelatin. Most of the commercial lemon supply comes from California and Arizona, and is available year-round. Look for lemons with a rich yellow color, reasonably smooth-textured skin with a slight gloss, and those, which are firm and heavy. A pale or greenish-yellow color indicates very fresh fruit with slightly higher acidity. Coarse or rough skin texture is a sign of thick skin and not much flesh. Avoid lemons with a darker yellow or dull color, or with hardened or shriveled skin (signs of age), and those with soft spots, mold on the surface, and punctures of the skin (signs of decay). Most limes sold at retail are produced in Florida or imported from Mexico, and are marketed when mature. Imported limes are mostly the smaller “seeded” lime. Look for limes with glossy skin and heavy weight for the size. Selection of melons for quality and flavor is difficult, challenging the skill of even the most experienced buyer. Although no absolute formula exists, considering several factors when judging a melon will increase the likelihood of success. Cantaloupes, generally available from May through September, are produced principally in California, Arizona, and Texas. Some are also imported early in the season. There are three major signs of full maturity. First, the stem should be gone, leaving a smooth symmetrical, shallow base called a “full slip.” If all or part of the stem base remains, or if the stem scar is jagged or torn, the melon is probably not fully matured. Second, the netting, or veining, should be thick, coarse, and corky, and should stand out in bold relief over some part of the surface. Third, the skin color (ground color) between the netting should have changed from green to yellowish-buff, yellowish-gray, or pale yellow. A cantaloupe might be mature, but not ripe. A ripe cantaloupe will have a yellowish cast to the rind, a pleasant aroma, and yield slightly to light thumb pressure on the blossom end of the melon. Most cantaloupe are quite firm when freshly displayed in retail stores. While some may be ripe, most have not yet reached their best eating stage. Hold them for 2 to 4 days at room temperature to allow completion of ripening. After conditioning the melons, some people like to place them in the refrigerator for a few hours before serving. Over ripeness is indicated by a pronounced yellow rind color, a softening over the entire rind, and soft, watery, and insipid flesh. Small bruises normally will not hurt the fruit, but large bruised areas should be avoided, since they generally cause soft, water-soaked areas underneath the rind. Mold growth on the cantaloupe (particularly in the stem scar, or if the tissue under the mold is soft and wet) is a sign of decay. The outstanding flavor characteristics of honeydews make them highly prized as a dessert fruit. The melon is large (4 to 8 lb. ), bluntly oval in shape, and generally very smooth with only occasional traces of surface netting. The rind is firm and ranges from creamy white to creamy yellow, depending on the stage of ripeness. The stem does not separate from the fruit, and must be cut for harvesting. Honey dew are available to some extent almost all year round, due in part to imports during the winter and spring. Chief sources, however, are California, Arizona, and Texas. The most abundant supplies are available from July through October. A soft, velvety texture indicates maturity. Slight softening at the blossom end, a faint pleasant fruit aroma, and yellowish-white to creamy rind color indicate ripeness. Dead-white or greenish-white color and a hard, smooth feel are signs of immaturity. Large, water-soaked, bruised areas are signs of injury; and cuts or punctures through the rind usually lead to decay. Small, superficial, sunken spots do not damage the melon for immediate use, but large decayed spots will. Watermelons are available to some degree from early May through September, but peak supplies come in June, July, and August. Judging the quality of a watermelon is very difficult unless it is cut in half or quartered. Look for firm, juicy flesh with good red color that is free from white streaks; and seeds that are dark brown or black. Seedless watermelons often contain small white, immature seeds, which are normal for this type. Avoid melons with pale-colored flesh, white streaks (or “white heart”), and whitish seeds (indicating immaturity). Dry, mealy flesh, or watery stringy flesh is a sign of over maturity or aging after harvest. If you want to buy an uncut watermelon, here are a few appearance factors, which may be helpful (though not totally reliable) in guiding you to a satisfactory selection. The watermelon surface should be relatively smooth; the rind should have a slight dullness (neither shiny nor dull); the ends of the melon should be filled out and rounded; and the underside, or “belly” of the melon should have a creamy color. Nectarines, which are available from June through September from California, combines characteristics of both the peach and the plum. Look for rich color and plumpness, and a slight softening along the “seam” of the fruit. Most varieties have an orange-yellow background color between the red areas, but some varieties have a greenish background color. Bright-looking fruits, which are firm to moderately hard, will probably ripen within 2 or 3 days at room temperature. Avoid hard, dull fruits or slightly shriveled fruits (which may be immature — picked too soon — and of poor eating quality) and soft or overripe fruits or those with cracked or punctured skin or other signs of decay. Russeting or staining of the skin may affect the appearance but not detract from the internal quality of the nectarine. California, Florida, Texas, and Arizona produce our year-round supply of oranges. Leading varieties from California and Arizona are the Washington Navel and the Valencia, both characterized by a rich orange skin color. The Navel orange, available from November until early May, has a thicker, somewhat more pebbled skin than the Valencia; the skin is more easily removed by hand, and the segments separate more readily. It is ideally suited for eating as a whole fruit or in segments in salads. The western Valencia orange, available from late April through October, is excellent either for juicing or for slicing in salads. Florida and Texas orange crops are marketed from early October until late June. Parson Brown and Hamlin are early varieties, while the Pineapple orange — an important, high-quality orange for eating — is available from late November through March. Florida and Texas Valencia’s are marketed from late March through June. The Florida Temple orange is available from early December until early March. Somewhat like the California Navel, it peels easily, separates into segments readily, and has excellent flavor. “Discoloration” is often found on Florida and Texas oranges, but not on California oranges. This is a tan, brown, or blackish mottling or specking over the skin. It has no effect on eating quality, and in fact often occurs on oranges with thin skin and superior eating quality. Look for firm and heavy oranges with fresh, bright-looking skin, which is reasonably smooth for the variety. Avoid lightweight oranges, which are likely to lack flesh content and juice. Very rough skin texture indicates abnormally thick skin and less flesh. Dull, dry skin and spongy texture indicate aging and deteriorated eating quality. Also avoid decay — shown by cuts or skin punctures, soft spots on the surface, and discolored, weakened areas of skin around the stem end or button. A great many varieties of peaches are grown, but only an expert can distinguish one from another. These varieties, available May to November, fall into two general types: freestone (flesh readily separates from the pit) and clingstone (flesh clings tightly to the pit). Freestones are usually preferred for eating fresh or for freezing, while clingstones are used primarily for canning, although they are sometimes sold fresh. Look for peaches, which are fairly firm, or becoming a trifle soft. The skin color between the red areas (ground color) should be yellow or at least creamy. Avoid very firm or hard peaches with a distinctly green ground color, which are probably immature and won’t ripen properly. Also avoid very soft fruits, which are overripe. Don’t buy peaches with large flattened bruises (they’ll have large areas of discolored flesh underneath) or peaches with any sign of decay. Decay starts as a pale tan spot, which expands in a circle and gradually turns darker in color. The most popular variety of pear is the Bartlett, which are produced in great quantities (in California, Washington, and Oregon) both for canning and for sale as a fresh fruit. With the aid of cold storage, Bartlett pears are available from early August through November. Several fall and winter varieties of pears are grown in Washington, Oregon, and California, and shipped to fresh fruit markets. These varieties — Anjou, Bosc, Winter Nellis, and Comice — keep well in cold storage and are available over a long period, from November until May. Look for firm pears of all varieties. The color depends on variety. For Bartletts, look for a pale yellow to rich yellow color; Anjou or Comice — light green to yellowish-green; Bosc — greenish-yellow to brownish-yellow (the brown cast is caused by skin russeting, a characteristic of the Bosc pear); Winter Nellis — medium to light green. Pears, which are hard when you find them in the grocery store, will probably ripen if kept at room temperature, but it is wise to select pears that have already begun to soften — to be reasonably sure that they will ripen satisfactorily. Avoid wilted or shriveled pears with dull-appearing skin and slight weakening of the flesh near the stem, which indicates immaturity. These pears will not ripen. Also avoid spots on the sides or blossom ends of the pear, which means that corky tissue may be underneath. Pineapples are available all year, but are most abundant from March through June. Hawaii, Puerto Rico, and Mexico are principal suppliers. Present marketing practices, including air shipments, allow pineapples to be harvested as nearly ripe as possible. They are delivered to market near the peak of sweetness, with color ranging from green to orange and yellow. A mature green pineapple will normally turn yellow to orange within a few days at room temperature, but many are already fully colored when you find them in the grocery store. Look for bright color, fragrant pineapple aroma, and a very slight separation of the eyes or pips — the berry-like fruitlets patterned in a spiral on the fruit core. At their mature stage, pineapples are usually dark green, firm, plump, and heavy for their size. The larger the fruit, the greater the proportion of edible flesh. As the popular varieties ripen, the green color turns to orange and yellow. When fully colored, pineapples are golden yellow, orange-yellow, or reddish brown, depending on the variety. Avoid pineapples with sunken or slightly pointed pips, dull yellowish-green color, and a dried appearance — all signs of immaturity. Also avoid bruised fruit, shown by discolored or soft spots, which are susceptible to decay. Other signs of decay are traces of mold, unpleasant odor, and eyes, which are dark and watery. Quality characteristics for both are very similar, and the same buying tips apply to both. Plums — A number of varieties of plums are produced in California and are available from June to September. Varieties differ slightly in appearance and flavor, so you should buy and taste one to see if that variety appeals to you. Prunes — Only a few varieties of prunes are commonly marketed, and they are all very similar. Prunes are purplish-black or bluish-black, with a moderately firm flesh, which separates freely from the pit. Most commercial production is in the Northwestern States. Fresh prunes are available in grocery stores from August through October. Look for plums and prunes with a good color for the variety, that are in a fairly firm to slightly soft stage of ripeness. Avoid fruits with skin breaks, punctures, or brownish discoloration. Also avoid immature fruits (relatively hard, poorly colored, very tart, sometimes shriveled) and over mature fruits (excessively soft, possibly leaking or decaying). Blackberries, raspberries, dewberries, loganberries, and youngberries are similar in general structure. They differ from one another in shape or color, but quality factors are about the same for all. Look for a bright, clean appearance and a uniform good color for the species. The individual small cells making up the berry should be plump and tender but not mushy. Look for berries that are fully ripened, with no attached stem caps. Avoid leaky and moldy berries. You can usually spot them through the openings in the ventilated plastic containers. Also look for wet or stained spots on wood or fiber containers, as possible signs of poor quality or spoiled berries. First shipments of strawberries come from southern Florida in January, and then production increases, gradually spreading north and west into many parts of the country before tapering off in the fall. Strawberries are in best supply in May and June. Look for berries with a full red color and a bright luster, firm flesh, and the cap stem still attached. The berries should be dry and clean, and usually medium to small strawberries have better eating quality then large ones. Avoid berries with large uncolored areas or with large seedy areas (poor in flavor and texture), a full shrunken appearance or softness (signs of over ripeness or decay), or those with mold, which can spread rapidly from one berry to another. In most containers of strawberries you will likely find a few that are less desirable than others. Try to look at some of berries lower in the container to be sure that they are reasonably free from defects or decay. Florida is the chief source of tangerines. Considerable quantities of tangerines and similar types of oranges are produced in California and Arizona, some in Texas, and few are imported. Tangerines are available from late November until early March, with peak supplies in December and January. The Murcott, a large, excellent variety of orange resembling the tangerine, is available from late February through April. A deep yellow or orange color and a bright luster are your best sign of fresh, mature, good-flavored tangerines. Because of the typically loose nature of tangerine skins, they will frequently not feel firm to the touch. Avoid very pale yellow or greenish fruits, which are likely to be lacking in flavor (although small green areas on otherwise high-colored fruit are not bad), and tangerines with cut or punctured skins or very soft spots (all signs of decay, which spreads rapidly).